Can The We R Sports Exercise Bike Provide The Aerobic Training And Fitness Improvements It Claims? The We R Sports Aerobic Training Cycle Exercise Bike is a odd looking machine; stylish and modern with a compact look to suit the static, living room setting. The initial, basic product description for this machine is rather vague because it only really says that it can display five functions on the monitor display – speed,distance, calories, time and scan – and that the 13kg flywheel and resistance are great for fitness and improving stamina. To really know what this machine can and cannot do, we need to look at the customer testimonials. Does this We R Sports Bike have more than just an interesting style and informative display and are buyers happy with the purchase? 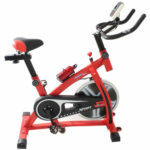 What advantages have users experienced with this We R Sports Cardio Workout Exercise Bike and how well does it perform? For the most part, the reviews for this bike have been very positive because it provides a high quality performance that buyers enjoy. 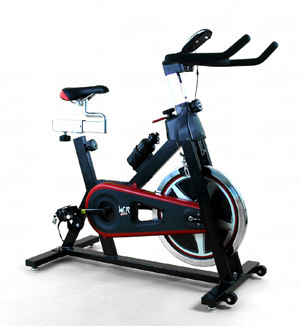 This We R Sports exercise bike looks compact and ideal for the home – with dimensions of 108 x 53 x 124cm – but the black and red design offers a different style to other, more traditional looking exercise bikes. In addition to looking good, buyers state that it also performs well and most found it easy to assemble. It takes around half an hour to put together because even though the supplied tools are pretty useless, it is not too hard to figure out what goes where and the instructions are helpful for everything but the electronic console. The final constructed bike is undeniably heavy at 38 kilos but this just makes it more sturdy when it is in use and adds to the high user weight capacity, factors that are also aided by the heavy duty steel frame. 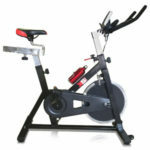 Once it has been assembled, this We R Sports Aerobic Training Cycle Exercise Bike appears to become a family friendly bike with different potential purposes, some riders seeing it as a great introduction to spinning for younger users and other using it in preparation for long distance road cycling and stamina building. This multi-user idea is made possible by the adjustability; the seat height and position and the handlebar height can be easily altered for different user preferences, although some buyers agree that it should be able to accommodate more foot sizes than it currently allows. Other positive comments and features to note include the emergency stop system for extra safety, the smooth performance, the ability to fine tune the resistance settings and the water bottle holder. Are there any other improvements that should be made or major disadvantages in the We R Sports Aerobic Training Exercise Bike’s design? While the product has plenty of benefits, some feel it is not quite gym quality, particularly given the less robust flywheel, and there is one massive problem that has been commonly repeated. Many buyers feel the machine would be brilliant if it wasn’t for the saddle; the words “razor” and “knife edge” have been used to describe the comfort of this feature and many users have had to buy a padded cover to compensate. Cynical consumers may wonder if this is all just a ploy to sell more accessories. There have also been a few questions raised over the quality and accuracy of the computer system. This may mean that it is not a trusted, reliable source of information but that does not seem to be that big a deal for users. Summary: should you look past the issues with the seat and try this We R Sports Bike for yourself? In short, it is worth taking a closer look at this bike because it brings spinning and fitness into the home with few problems and a level of performance that is close to what would be expected based on experiences of gym equipment. 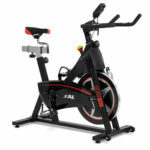 Essentially, this fitness cardio workout home cycling racing machine is an effective bike for a range of users with different fitness requirements, that is as long as buyers remember to add the gel seat into their online shopping cart and are not looking for the perfect computer console. This product is recommendable for anyone looking for a space-saving, stylish and demanding exercise bike that is also easy to set up and can be used by the whole household. 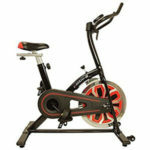 You can check out more customer reviews about this We R Sports Aerobic Training Cycle Exercise Bike at Amazon UK here.